For homeowners, any time is a good time to do exterior maintenance of their dream home. Many homeowners often ask themselves, “how do I find pressure washing near me?” Maintenance of your home, including washing your house siding, gutters, overhangs, and windows add to the life and beauty of your house. If you are looking for a professional touch you must hire a power washing contractor for your buildings exterior, driveway, parking lot, or other external surfaces because of the immeasurable benefits they can provide. The most noticeable benefit of power washing is that we can clean most surfaces regardless of the material they are made of. Power washing cleans stone, stucco, brick, limestone, and other hard surfaces which are impossible to be cleaned by hand. Moreover, it is very time consuming and ineffective when such cleaning projects are undertaken by hand as no amount of human muscle will ever get the surface gleaming and clean. 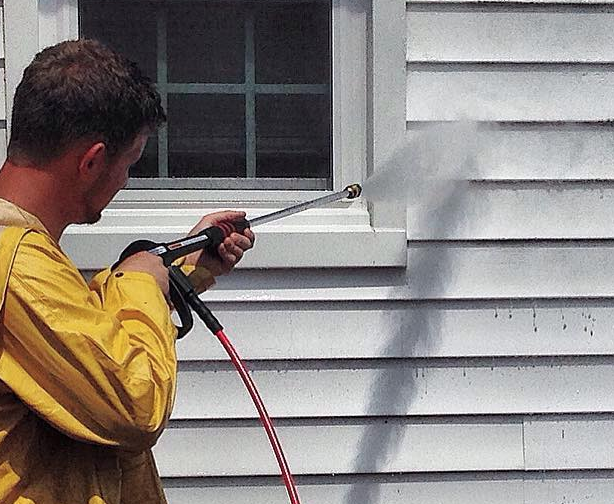 In addition to ease and convenience, power washing tends to saves an enormous amount of time. These processes are effective to strip away years of dirt and cakes of debris within seconds. However, in order for this process to be executed in an effective period of time, you must employ a professional. With a skilled power washing contractor such as Crystal Clear Shine, you can be assured of the smooth process from start to finish. Professional power washing companies often have a better sense of how to complete complicated cleaning projects in wide-ranging steps. Since we have more evolved techniques for getting at hard to reach spots we clean every nook and corner of your building. It is highly recommended that you opt for only a reputed and experienced power washing company so that you can be assured of quality cleaning services and achieve complete peace of mind. Moreover, you must have a close look at details of services and their existing client satisfaction. We offer residential and commercial power washing as two distinct services. At Crystal Clear Shine, we are able to wash even boat decks, semi-trailer floors, fishing docks, drive-through pads, boat ramps, tennis courts, roofs, warehouses, and boat ramps in addition to our normal commercial and residential work. In order to get rid of moss, oil, grease, dirt, bird droppings, graffiti, algae, fuel, bacteria, and other stubborn stains you have to resort to pressure washing. It ultimately creates and maintains higher standards of living, hygiene, home improvement, and cleanliness for your home or business. You achieve all these with an easy and smooth process without spending a fortune and endless hours buying the right cleaning tools, detergents, solutions, and equipment. Give Crystal Clear Shine a call today at (910) 758-0114!